UPDATE 10/2 - The LA Times reports that four teenagers have been arrested on suspicion of animal cruelty and burglary at Foster Farms. Officials were tipped off on social media to the identities of the suspects. Read the full story here. Officials are trying to catch the person guilty of breaking into chicken sheds at a poultry facility called Foster Farms in Caruthers, Calif., and clubbing 920 birds to death with a golf club. 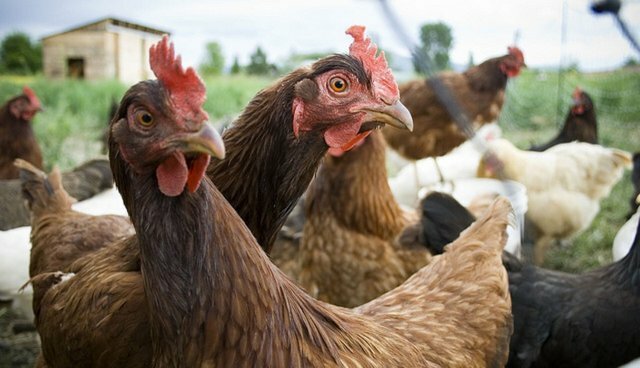 Foster Farms calls the random act of violence an "unconscionable act of animal cruelty," and is offering a $5,000 reward for information leading to the arrest and prosecution of the persons responsible for the crime. After the break-in, police found part of a golf club at the facility, though they believe another weapon was also used. "In law enforcement we see bad things all the time, but this is beyond comprehension, that people could take so much time to do this," Deputy Chris Curtice of the Fresno County Sheriff's Department told Fox station KMPH. "This is sick. Whoever did this is a sick individual. This is psychopathic behavior." Foster Farms owns 100 ranches along California's Central Valley. The company's products are American Humane Certified, meaning that it adheres to a baseline standard of animal welfare and is subject to periodic third-party audits at its facilities. Though not perfect, the facility could be considered a step up from most factory farms in the country. Nevertheless, undercover videos have revealed disturbing animal treatment at Foster Farms facilities in the past. Foster Farms has been making headlines recently for other issues, including allegations of "egregious" unsanitary conditions at its facilities and outbreaks of salmonella. Anyone with tips can contact the Fresno County Sheriff's Department, or call the Ag Task Force detectives at (559) 600-8150.